The CDS107 is a microprocessor based multi-purpose meter. 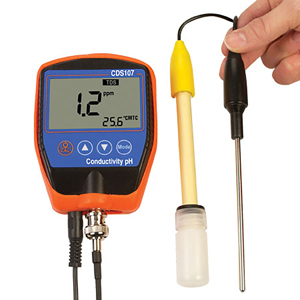 The meter can be used as a benchtop or handheld meter to measure pH, ORP, conductivity, total dissolved solids, salt and temperature. Features include automatic temperature and altitude compensation with the ability to manually adjust the salinity compensation. Additionally the meter has auto shut-off to save battery life, a minimum/maximum function and data storage. NOTA: Comes complete with 9V batteries, AC adaptor, conductivity probe, pH probe, temperature probe, cal solutions, neck strap, carrying case and operator’s manual. ORP probes sold separately.